UPGRADED MESSENGER BAG: The updated version of the messenger bag features a laptop pocket equipped with Velcro instead of zipper to prevent your laptop from being scratched. Additionally, water-resistant waxed canvas keeps moisture out of the bag to protect your electronic products. PREMIUM MATERIALS: The exterior of the messenger bag is constructed of premium leather, and water-resistant waxed canvas to ensure long-lasting performance. Implemented with reinforced strong seams for added strength and durability. LAPTOP POCKET: The main compartment features a laptop sleeve(15.7 x 9.4 x 1.6in) that can fit most laptops like macbook pro up to 15" in size. Compared with other messenger bags, its laptop sleeve is padded with anti-collision isolation foam which provides protection for your laptop against impacts and shocks. Note: Please check the size of your laptop before purchasing. VARIOUS POCKETS FOR YOUR STORAGE: The multi-pocket design houses everything you need for your travel, business work or school study. The main compartment is designed with 1 interior zipper pocket and 2 slip pockets to hold your wallet, credit cards, bank cards, power bank and cellphone. Also, there are two front pockets and 1 back magnetic pocket that provide extra space to store your documents and frequently used items like eye glasses and keys. 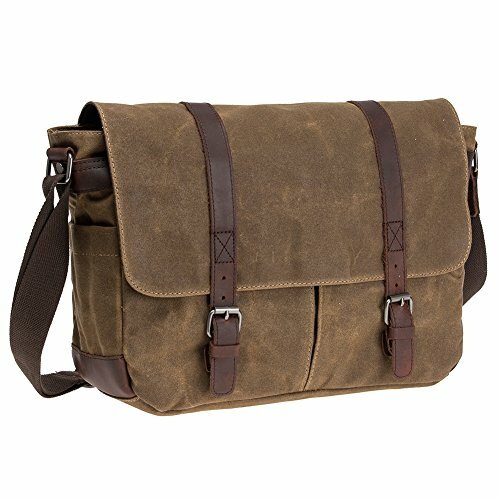 PORTABILITY & CONVENIENCE: This waxed canvas messenger bag comes with a carry handle and an adjustable shoulder strap with moving pad to offer multiple carrying ways, and also helps you relieve pressure. For your convenience, the flap is equipped with magnetic snaps that allow for easy access to your stored items. It is suitable for students, office workers and travel enthusiasts. UPGRADED MESSENGER BAG: The updated version of the messenger bag features a laptop pocket equipped with magic tape instead of zipper to prevent your laptop from being scratched. Additionally, water-resistant waxed canvas keeps moisture out of the bag to protect your electronic products. Waxed Canvas: The mens messenger bag is made of high-quality cow leather and waterproof canvas, which can be used for a long time. Disordered wrinkles and scratches on the surface create retro and wild looks. Thickened Laptop Compartment: Our waxed canvas briefcase provides a safer environment for your laptop. We know the difference lies in the thickened laptop compartment after we tried several kinds of other products. Upgraded Magnetic Snap: Our leather laptop bag is different from ordinary bags, its magnetic snap has better effect and not easy to open, providing a better protection for all your items in the bag. 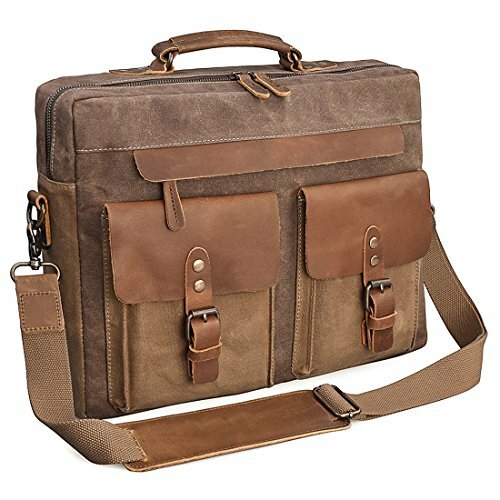 Larger Size & Multiple Pockets: The size of this briefcase is 16.1"*11.8"*3.9".The laptop compartment size is 14.76"*9.84"*1.18". 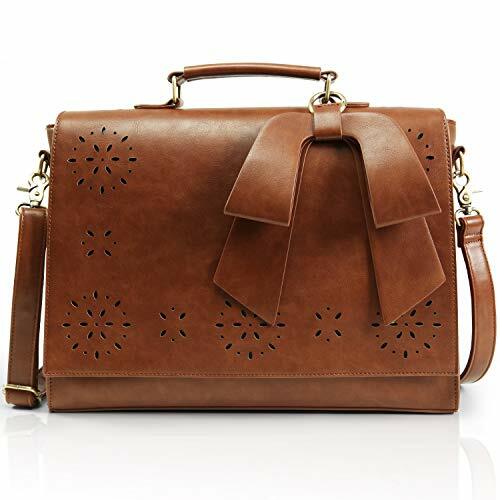 This leather cross-body bag has 9 pockets for all your needs. 5 outer pockets and 4 inner pockets for bottle, umbrella, cards, wallet, laptop and anything else. 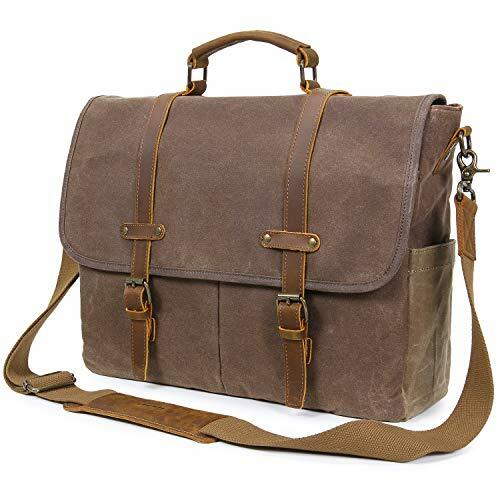 Detachable & Adjustable Strap: The shoulder strap of this leather waxed canvas bag is detachable, you can adjust it to a length which fits you most perfectly and comfortably. Padded handle and strap also help you relieve fatigue. IMPROVEMENTS LAPTOP COMPARTMENT: Lifewit Laptop Messenger Bag's laptop compartment can house laptop computers of up to 17.3 inches. Padded with foam cotton, and enhanced with strap, the anti-shock compartment protects stored laptop by absorbing impacts that can be inflicted in daily life. MULTI-PURPOSE POCKETS:Excluding 17.3 x 2 x 13 inch laptop compartment, featured on the messenger bag is 1 large back zipper pocket, 2 front pockets with snaps, 1 inner zipper pocket, 2 inner wall pockets, 2 inner pen sleeves, and 2 side pockets with magnetic buckles. LARGE CAPACITY:The size of the bag is 17.5 x 5 x 13 inch, larger than the common briefcase. Implemented are 2 buckle straps instead of magnetic buttons for added security. PORTABILITY:The messenger bag features a wide adjustable shoulder strap and equipped with a moveable mesh pad to eliminate shoulder fatigue. WATER RESISTANCE & DURABILITY: The messenger bag is made of water-resistant nylon to keep moisture out of the bag. Metal buckle, anti-rust zipper and reinforced seams are also implemented for long lasting performance under demanding use. 15.6 INCH MAIN LAPTOP COMPARTMENT: The overall dimensions of the laptop bag are about 42 x 34 x 11cm/16.5 x 13.4 x 4.3in. There are a total of 15 pockets on the main compartment, including 12 slip pockets, 2 pen cases and 1 laptop sleeve. Also, the laptop sleeve can fit most laptops of up to 15.6" in size. INNOVATIVE ANTI-COLLISION DESIGNS: The back and the bottom of the main compartment are equipped with an anti-collision pad to protect your valuables, such as cell phone or iPad against impacts and shocks. In addition, the feet pads on the bottom protect bag from scratching. PORTABLE & COMFORTABLE: Providing both ergonomic comfort and travel convenience, this laptop bag features a luggage strap for easy attachment to your rolling luggage, a carry handle and an adjustable/detachable shoulder strap with honeycomb pad to relieve pressure. DURABLE CONSTRUCTION:Constructed out of water-resistant nylon，updated the buckles, metal fasteners,and SBS zippers to ensure long lasting performance. Implemented with strong reinforced seams for added strength and durability. LAPTOP POCKET: The main compartment features a laptop pocket with the anti-collision isolation pad to fit laptops up to 17" in size and protect them against impact and shocks. In addition, it features a dedicated file section and multiple accessory compartments to safely store various documents and keep items organized. INNOVATIVE DESIGNS: The large side pockets are designed to hold any size of water bottle, while the loops on the side pockets providing extra space for hanging sunglasses, tennis rackets, and more. The feet pads on the bottom protect bag from scratching, and double zipper design allows for easy access to stored items. MULTI-PURPOSE POCKET: The multi-pocket design houses everything you need for work or school. 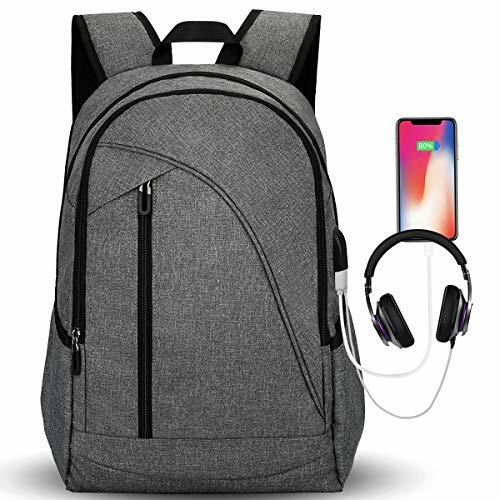 The front zipper compartment is designed with built-in keychain and pen case, while the 3 exterior pockets hold cell phones, chargers, earphones, power banks or other small items. PORTABILITY: Providing both ergonomic comfort and travel convenience, this laptop bag features a luggage strap for easy attachment to rolling luggage, dual carry handles, and an adjustable/detachable shoulder strap with breathable honeycomb pad to relieve pressure. TECH GEAR COMPARTMENT: Lifewit Laptop Messenger Bag's laptop compartment can house laptop computers of up to 17.3 inches. Padded with foam cotton, and enhanced with strap, the anti-shock compartment protects stored laptop by absorbing impacts that can be inflicted in daily life. MULTIPLE POCKETS: Excluding 17.8 x 2 x 13 inch laptop compartment, featured on the messenger bag is 1 large back zipper pocket, 2 front pockets with snaps, 1 inner zipper pocket, 2 inner wall pockets, 2 inner pen sleeves, and 2 side pockets with magnetic buckles. LARGE SIZE: The size of the bag is 19.7 x 5.9 x 14.6 inch, larger than the common briefcase. Implemented are 2 buckle straps instead of magnetic buttons for added security. LAPTOP POCKET: The main compartment features a laptop pocket with the anti-collision isolation pad to fit laptops up to 16" in size and protect them against impact and shocks. In addition, it features a dedicated file section and multiple accessory compartments to safely store various documents and keep items organized. 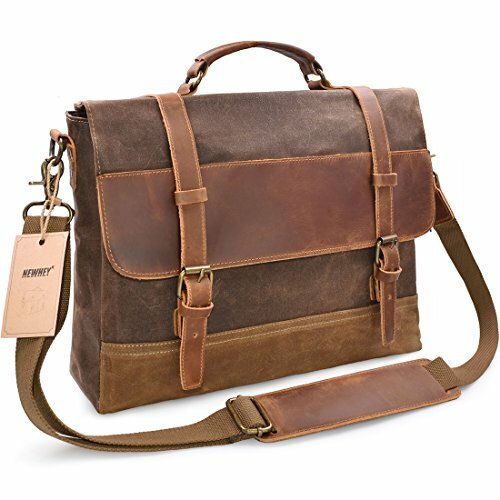 DURABLE & WATERPROOF: Fashion men messenger bag is made of superior crazy horse cowhide leather and water resistant canvas for long-term use. Disordered wrinkles and scratches on surface create a vintage and wild looking. 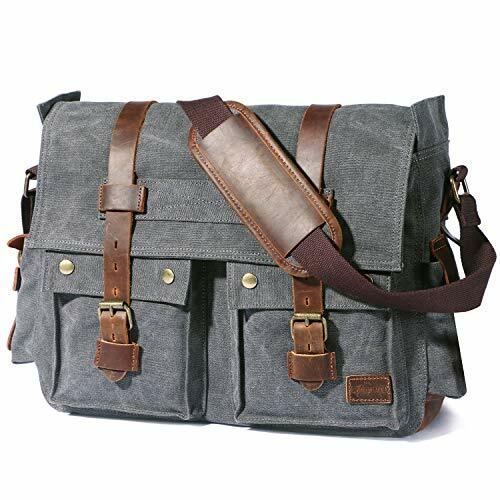 ❤QUALITY MATERIAL:The messenger bag exterior material is crafted out of water-resistant durable waxed canvas fabric, cloth-lined interior is thickening &durable. build with solid buckles,handle,smooth zipper,magnetic buttons,detachable shoulder strap and leather accents. ❤VARIOUS POCKETS:The laptop bag total with 10 pockets,large main compartment included➧1 padded sleeve for laptop; 2 inner pockets; 1 deeper inner zipper pocket; 2 pen slip pockets. 2 front large pockets with buckle secure; 1 internal button closure pocket ;1 back pocket. it's help hold all of your essentials separately. 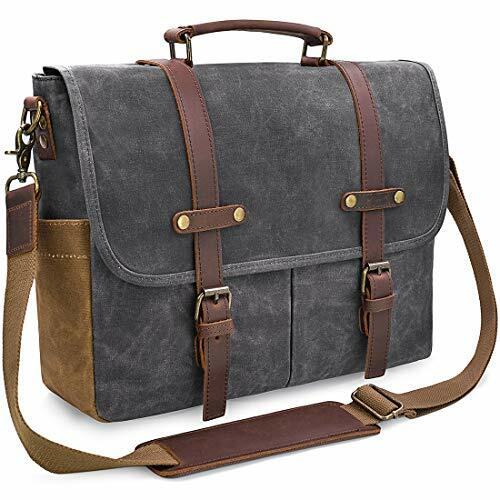 ❤SPECIAL DESIGN:Mens messenger bag shoulder strap length adjusts Max to 55", with a thicken widen shoulder pad that eliminates shoulder fatigue. this laptop compartment are foam padded with velcro closure, protecting your notebook against impacts from bumps and drops. 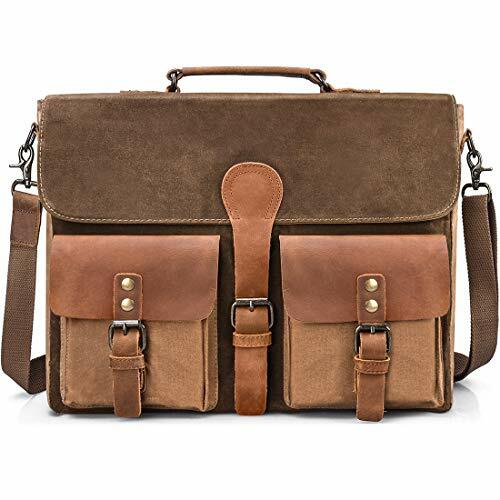 ❤CUSTOMIZABLE CARRY BAG:This messenger bag comes with an adjustable/detachable shoulder strap and a leather handle on the top of the messenger bag, you can use it as a shoulder bag, satchel bags,briefcase,crossbody bag or handbag. ❤WARRANTY:Our laptop bag made of superior waxed canvas fabric sewed with durable and strong lining to ensure last for years. We offer 1-Year replacement or refund guarantee, and lifetime supported by Tocode. 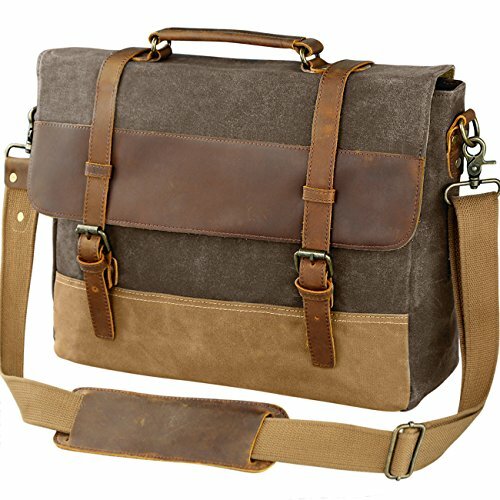 【MATERIAL】♥DURABLE & WATERPROOF♥ SOAEON Mens messenger bag is made of water resistant canvas and superior crazy horse cowhide leather, excellent workmanship, which shows your outstanding temperament. Disordered wrinkles and scratches on surface create a vintage and wild looking. 【DIMENSION】♥LARGE CAPACIT♥ The external dimension of this canvas briefcase is 16.1"L * 4.7"W * 12.5"H. Front pocket dimension: 6.7"L * 5.5"W. Different pockets for putting your bottle, umbrella, cards, wallet, laptop and anything in their right position. 【CONVENIENT & SAFE】♥MAGNETIC SNAP & PADDED LAPTOP SLEEVE♥ Laptop bag is double secured by magnetic snaps and zippers. Inner padded laptop sleeve fits up to 15.6 inch laptop and cohesive seal ensure it to be steady. 【MULTIPURPOSE】♥REMOVABLE & ADJUSTABLE STRAP♥ The canvas messenger bag features a non slip and removable shoulder strap which can be easily adjusted to preferred lengths. Padded handle and strap are also helpful to ease your fatigue. Perfect to use as a business portable briefcase. 【100% SATISFACTION GUARANTEE】 ♥HAPPY TO HELP♥ Our goal is to make sure everyone is a happy customer. If you have any problems with your product, please contact us without hesitation, we're always here and will try our best to help you solve the problem and make you satisfied. 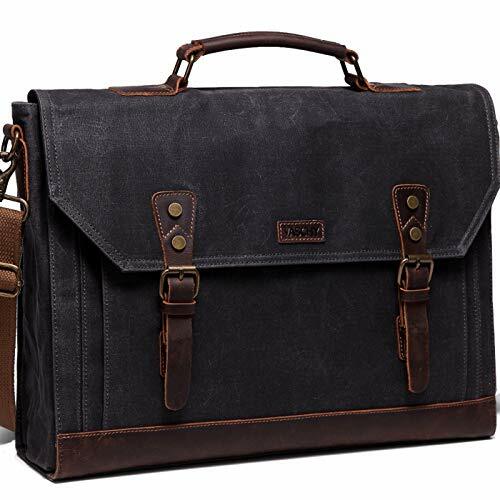 Sheng TS classically-inspired styled briefcase-like messenger bag for men / women is fashioned mainly from a waxed canvas and a bit of leather straps, which add, in turn, to the rustic appeal of this canvas leather messenger bag. 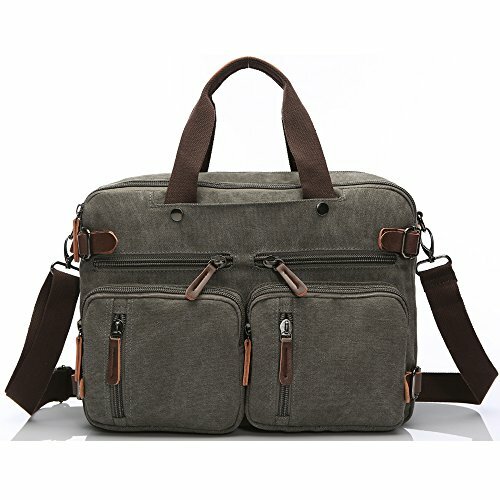 Cut for function and performance, Sheng TS convertible, 3 in 1 bag- both a messenger bag and a backpack in one bag- okay, it is a briefcase/handbag as well- is made out of first class canvas and leather trim. 【PREMIUM MATERIAL】: This large messenger bag made of super quality water-resistant waxed canvas fabric. With solid and sturdy hardware for zippers, buckles, closures and latches to ensure long lasting durability. 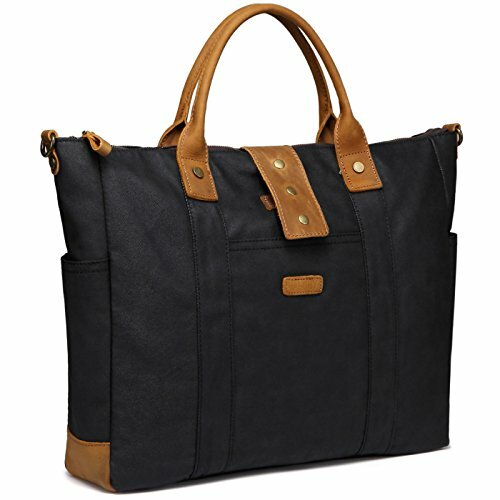 【VARIOUS POCKETS&ROOMY】: The laptop bag contains a total of 9 compartments, 1 padded part for laptop, 1 large main compartment with main secure zipper closure, 2 inner pockets, 2 middle pockets and 2 front pockets secured by the the magnetic clasps fitted inside, 1 back pocket with zipper for significant articles. 【ONE BAG FOUR STYLES】: There are 4 different ways for the men's laptop shoulder bag. 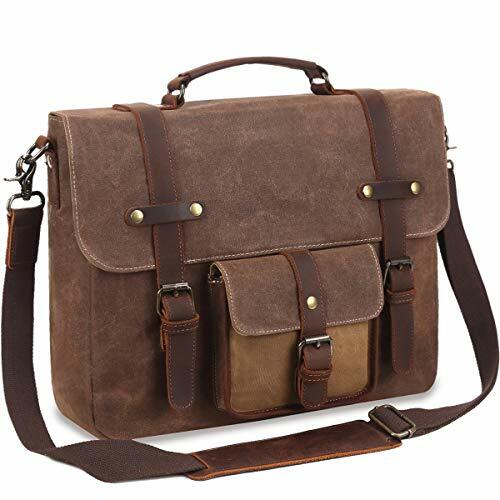 The adjustable shoulder strap could be easily adjusted to appropriate length to be a shoulder bag or a cross-body bag, the detachable designing of shoulder strap can be removed to make your bag as a business briefcase or a hand bag. 【SPECIAL DESIGN】: The wider padded leather on the shoulder strap makes the mens bag easy and comfortable to carry. The buckles on the front are just for decoration and insert buckle lead you a quick access into the pockets. 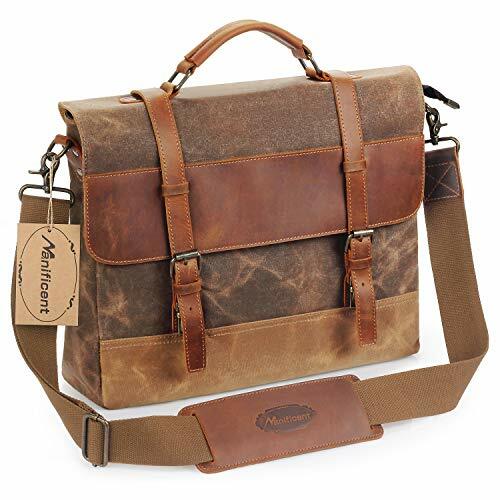 The front of the mens vintage messenger bag is double secured by the strong magnetic clasps fitted inside. 【RISK FREE】: Our leather briefcases adopt high quality raw materials and with excellent workmanship. We offer ONE YEAR replacement or refund. 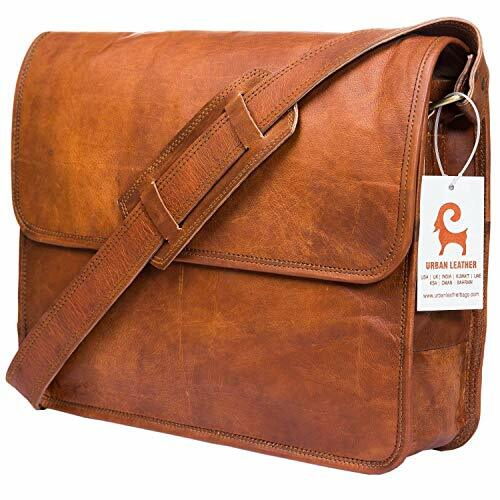 Please contact us freely if you have any question on our mens vintage messenger bag. ✔ Size: 16*12*5 inches, fits up to 15" laptop. ✔ Solid: Bronze finish hardware and high density canvas strap with genuine leather shoulder pad. ✔ Vintage Style: This is beautiful & incredibly well made. The canvas is very thick and it will stand up to lots of rugged use. 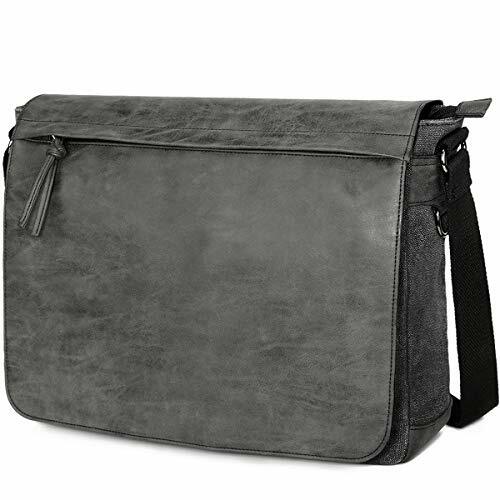 PERFECT SIZE - With dimensions of 15 x 11.4 inches and weight of 2.2lbs, this elegantly designed Women's laptop messenger bag is a perfect size for all your needs. ELEGANT STYLING, FASHION STATEMENT - Lifewit's new shoulder messenger bag for ladies creates a fashion statement with practical advantages. This elegantly designed laptop messenger bag/briefcase is made of glamorous PU leather with a delicate ribbon cutout design on the front. A feminine design with a professional look. LARGE CAPACITY - As always, Lifewit ensures that its range of bags are practical to use for daily life. With 1 large main compartment, 2 smaller compartments, a zippered pocket, a padded compartment for laptops ( 13-14 inch), this bag can carry all your essentials easily. SUITABLE FOR ALL OCCASIONS - Carry this Ladies laptop messenger bag with you for work, business trips, meetings, to the school, interviews or casual daily use. Use it as a briefcase, handbag, messenger bag or as a shoulder bag. 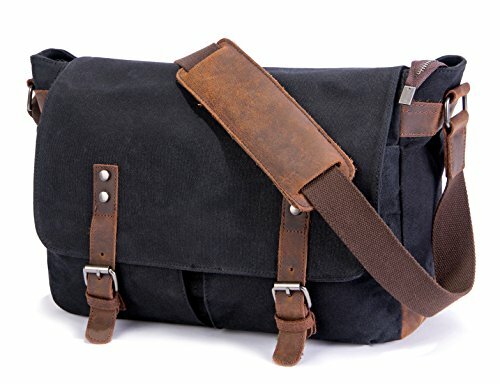 ✓【Durable & Waterproof】The canvas messenger bag is crafted from 90% Waterproof Durable Canvas + 10% Genuine Leather, which is great for long-term use. The waterproof material can keep your laptop and documents dry during light rain. ✓【Multiple Pockets & Laptop Sleeve】Features 6 inner pockets, 4 outer pockets and 2 open pockets within the front pocket, where you can put your belongings in. 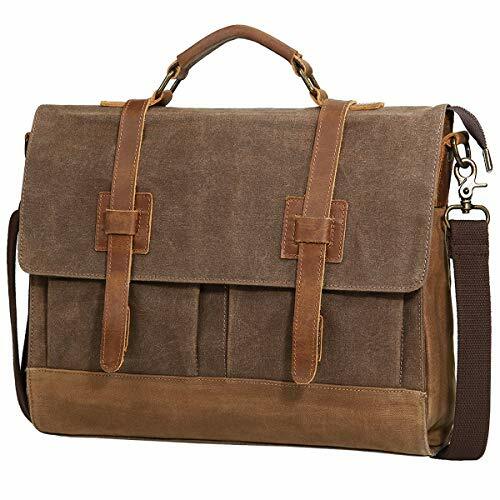 And the mens messenger bag has a padded laptop sleeve fits 15.6 inch laptop and cohesive seal ensure it to be steady. ✓【Detachable Strap & Multifunction Use】With the detachable and adjustable padded shoulder strap, the leather messenger bag can be used as a briefcase, shoulder bag, laptop bag. You can wear it to a formal occasion or a leisure place. 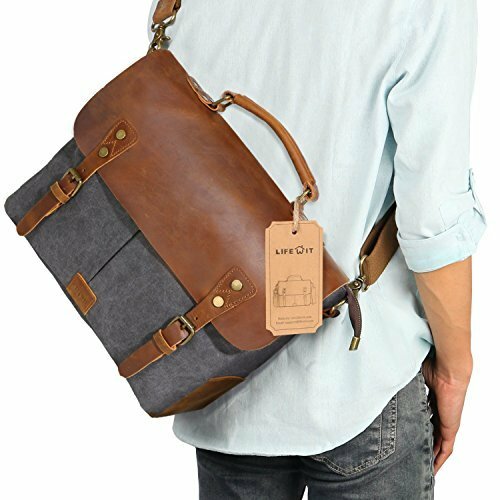 ✓【Magnetic Snaps & Easy Access】This mens messenger bag features magnetic snaps, you can easily open your messenger bag whenever you like. 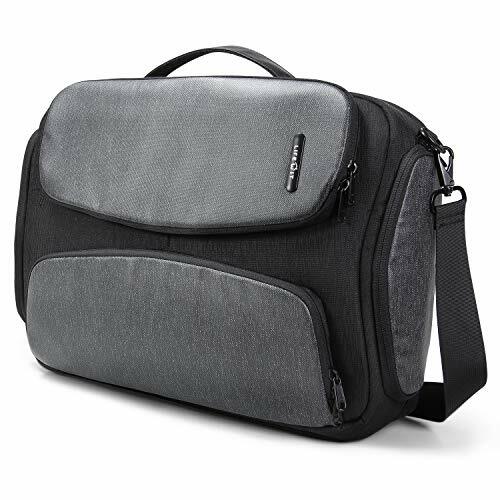 What's more, the laptop messenger bag has 2 side pockets, 1 back zip pocket and 1 front zip pocket, which makes you easier to take your stuff in and out. ✓【Dimension】The external dimension of this laptop bag is 15.1" L * 4.3" W * 12.4" H. Laptop sleeve dimension is 15.0" L * 9.5" W. It's a great ideal for business, work, school, college, travel. More Than Just Saying. WATER RESISTANCE & DURABILITY: The shoulder bag is made of water-resistant nylon to keep moisture out of the bag. Metal buckle, anti-rust zipper and reinforced seams are also implemented for long lasting performance under demanding use. UPGRADED CAPACITY: The dimensions of the crossbody bag has been increased to 31 x 26 x 11cm/12 x 10 x 4in. There are a total of 11 compartments, including 7 zipper pockets and 1 built-in key chain. Various compartments provides ample space to house everything you need for work and school. ANTI-COLLISION PAD: The back and the bottom of the main compartment are equipped with the anti-collision pad to protect your valuables, such as cell phone against impacts and shocks. The thickness of the foam pad is 15mm. 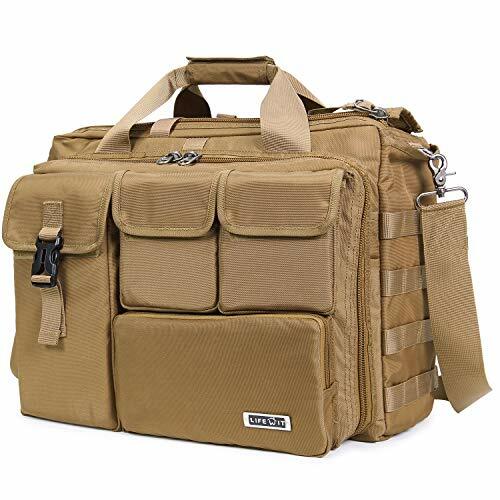 PORTABLE & COMFORTABLE: This shoulder bag comes with a carry handle and an adjustable/removable shoulder strap to offer multiple carrying options, and also helps you relieve shoulder pressure. Also, the shoulder strap features an adjustable anti-slip honeycomb pad. ADJUSTABLE SIDE POCKET: The two side pockets feature an expandable zippered opening allowing them to hold small water bottles and umbrellas when in use. UNIQUE STYEL& PORTABILITY: Unique style makes you stand out from the crowd.Full-leather handle makes it comfortable to carry as a handbag. 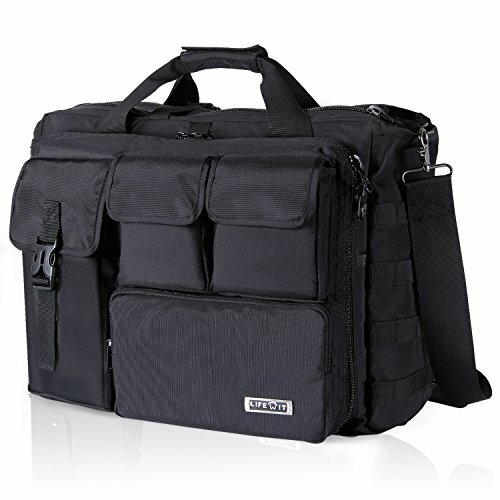 Features an adjustable and removable shoulder strap that eliminates shoulder fatigue. The bag can be carried by the handle, worn on shoulders and positioned across body. There is also a luggage belt that can be used to attach to most trolley bags making it convenient for traveling. MULTIFUNCTIONAL COMPARTMENT SORTING: The main compartment has two padded velcro sleeves - one for laptop, and one for tablets. Two front zipper pockets and 2 side zipper pockets for mobile phones, wallets or keys. The document zipper pocket on the back is also fit to hold frequently used items. 【PREMIUM MATERIAL】: This messenger bag made of super quality water-resistant waxed canvas fabric. With solid and sturdy hardware for zippers, buckles, closures and latches to ensure long lasting durability. 【SPECIAL DESIGN】: The wider padded leather on the shoulder strap makes the bag easy and comfortable to carry. The buckles on the front are just for decoration and insert buckle lead you a quick access into the pockets. 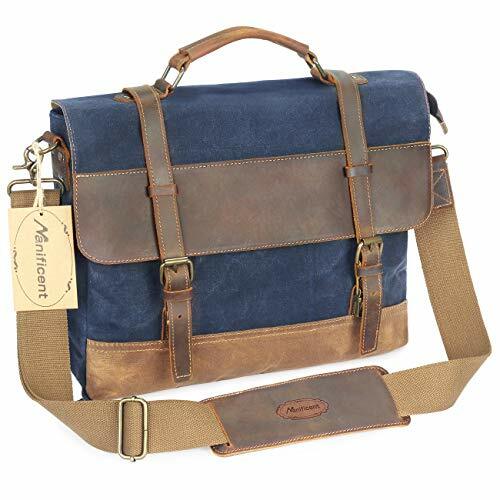 The front of the mens vintage messenger bag is double secured by the strong magnetic clasps fitted inside. 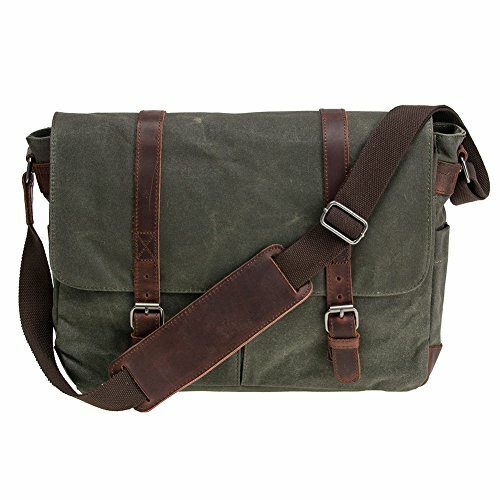 【Premium Wateproof Waxed Canvas】 Messenger bag for men is made of waterproof heavy waxed canvas material and crazy horse leather with bronze metal for long-term use,with leather/canvas combo give laptop satchel messenger bag strength, durability and a classic look.Best gift for Merry Christmas..
【Padded Laptop Sleeve & Enough Storage Room 】Brown mens messenger bag has thick padded laptop sleeve that can hold a 15.6'' MacBook Pro. A total of 8 pockets to meet all your needs.Two front pockets easy external access items. The multiple compartments for putting cell phone, laptop,pens, books, wallet, water bottle, umbrella,ect. A back slot of computer bags is perfect for an 9.7'' iPad. 【Quick Stronger Insert Buckle & Width Shoulder Pad】 The hold is much stronger and quicker than magnectic buckle when carrying messenger bag like mens leather briefcase it tends to open with heavy contents.The computer messenger bag could be a professional brown leather briefcase after detaching this strap. Adjustable and detachable strap makes it easy to handle,thicken wide adjustable High-density shoulder strap make the bag comfortable to carry. 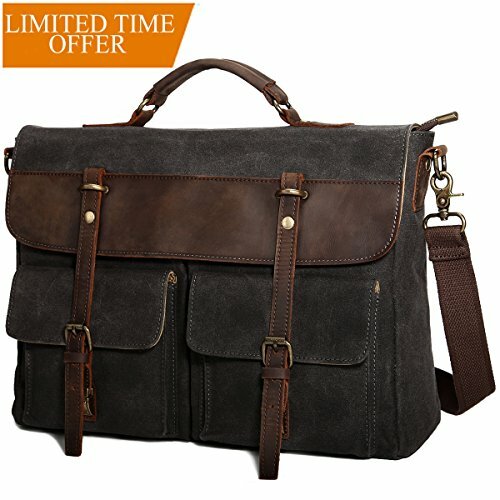 【External Dimensions】 16.5"(L)x13"(H) x 4.7"(W),Laptop pocket: 15'' (L)x10.6(H)'',Shoulder Strap adjusts:31.4"- 55'',Weight: 3.2pounds.Great briefcases for men/ laptop satchel messenger bag for a business men,woman,college students,work. 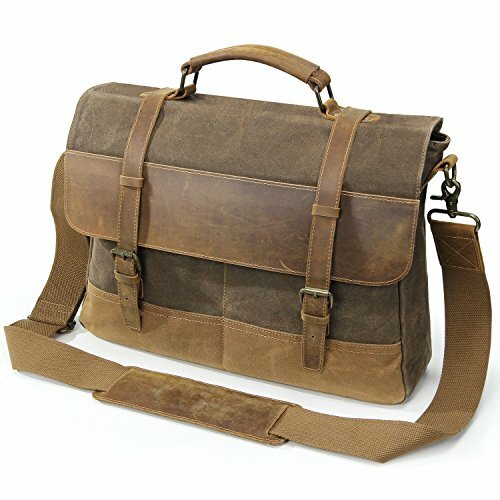 【Bronze Finish Metal & Multiple Carrying Styles】The antiqued bronze finish metal looks amazing and heavy built.There are 4 different ways for this mens computer bags.The adjustable shoulder strap could be easily adjusted to appropriate length to be a 15 inch mens shoulder bag or satchel bags for men.It is also a handle on the top of canvas messenger bag, use it as a brown leather briefcase or mens satchel shoulder bag. 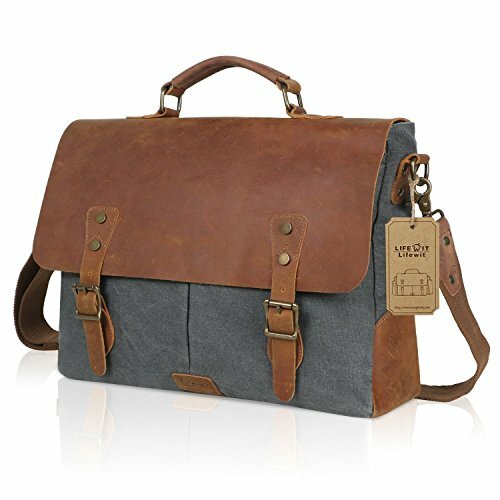 ✦-CLASSIC:The Vaschy women laptop bag is particularly designed for carrying the essentials to work.It is made of superior quality cowhide leather and durable waxed canvas which is gorgeous and last long. The full leather handles ensure the comfort and high-class look. ✦-VINTAGE: The delicate leather and anti-bronze hardware make the briefcase a vintage look.A contemporary take on the classic briefcase style. Adapted to suit the needs of the urban businessman and businesswomen, yet still retaining the traditional charm of it's predecessors.Combined with the leather handle and shoulder straps for enduring quality. Specifically chosen to resist wear and tear and provide reliable carrying capability. 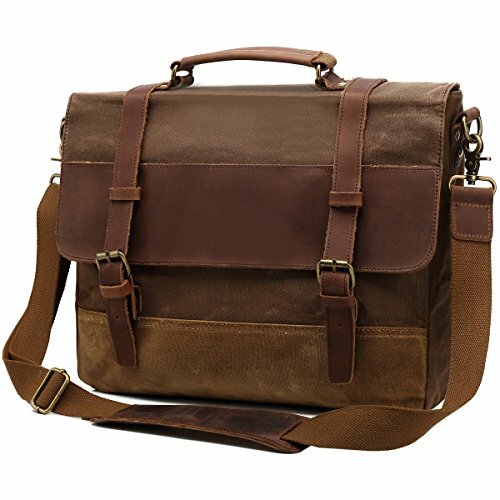 ✦-SPACIOUS:The leather canvas messenger bag features a main compartment of the bag intended to keep up to 15.6 inch laptop or a notebook with the padded compartment and an elastic strap,the laptop tote bag presents with a leather flap with three bronze snap closure, a back zipped pocket. There is also a pocket inside additionally for your money, wallets, important notes,pens.The strap is adjustable to provide comfort and can accommodate anyone. ✦-WARRANTY:With one year Warranty, The Vaschy laptop tote bag is a heavy-duty shoulder bag suitable for those who like vintage or can be used as a professional business briefcase.It is perfect for college students, business professionals or travelers want to make a fashion statement. WATERPROOF BAG WITH RAIN COVER - The Lifewit Multifunction Convertible briefcase is constructed out of top quality wear-resistant Polyester material, scratch resistant and coated with an anti-water treatment. It is also equipped with a rain cover, allowing you to effectively protect the contents within if it rains. INNOVATIVE REFLECTIVE STRIP & USB CHARING DESIGN- This lifewit bag is packed with so many unique design features that make traveling easy for everyone. There are reflective strips on the bottom of the bag that light up in the dark - very handy for night travelers. A back strap secures the bag to the handle of your trolley bag. Moreover, this Lifewit messenger bag is designed with a USB charging adapter on the right side that lets you recharge your phone or other devices without opening the bag. IMPROVEMENTS MATERIAL CONSTRUCTION - The briefcase is fitted with a protective flap on the front that is locked with two aluminium buckles.Also, we use best SBS zippers that are durable, slides smoothly.We have also added freely adjustable and detachable shoulder straps that has full 360 degree rotating end buckle heads. Soft pad on the shoulder strap increases carrying comfort. 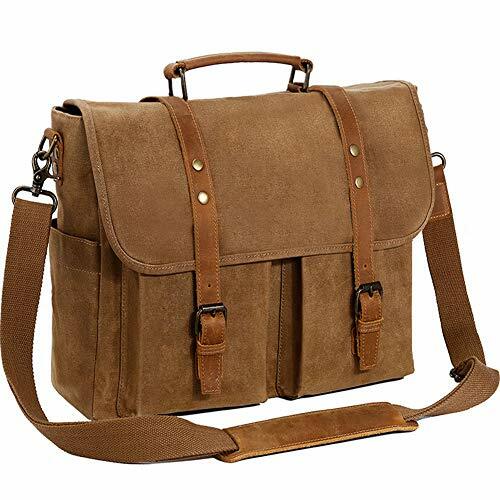 ★Comfortable Carry and Convenient: Padded shoulder straps of leather satchel bag can be detachable and fully adjustable to keep you comfortable, the sturdy top handles for long time comfortably carrying. 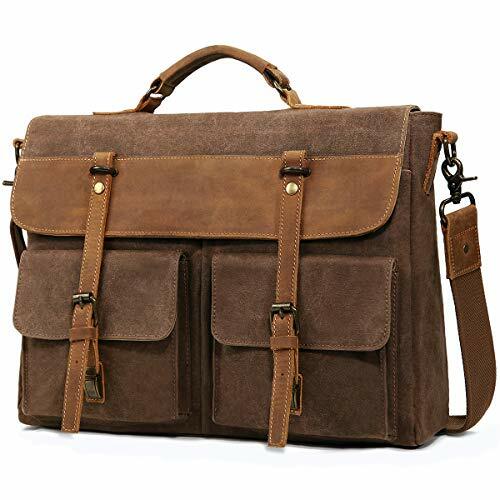 It can easily convert your briefcase to a single-shoulder bag which bring you convenience in different occasion. 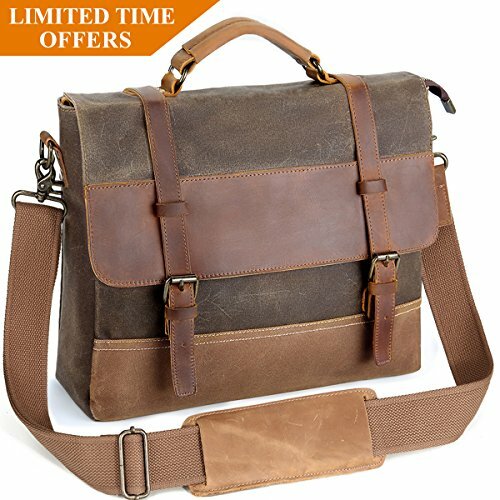 ★Quick Magnetic Buckle and Stylish: This vintage and stylish shoulder bags is double secured by magnetic buckle, that makes it quick access to your items. Get a classic crossbody bag, perfect for any situation, this sleek design keeps you moving in style and will receive many compliments during your commute, work, school, college, travel, etc. ★Satisfaction Guarantee: All of our bags have 1-YEAR WARRANTY. 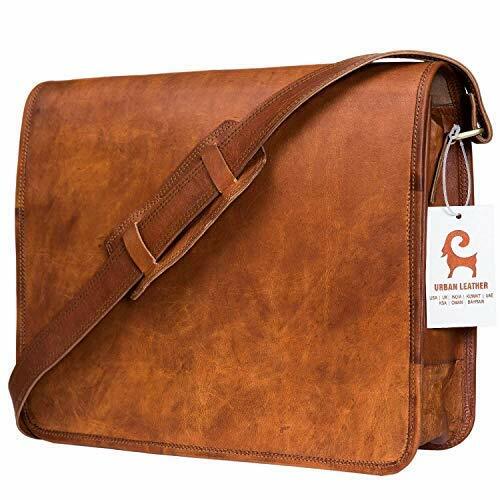 Just order this canvas leather messenger bag if you love it, there is no worry about the issue. We are serious sellers, and we are always responsible to our customers. If you have strap rip problem with your bag, please contact us. We will resend or refund to you. 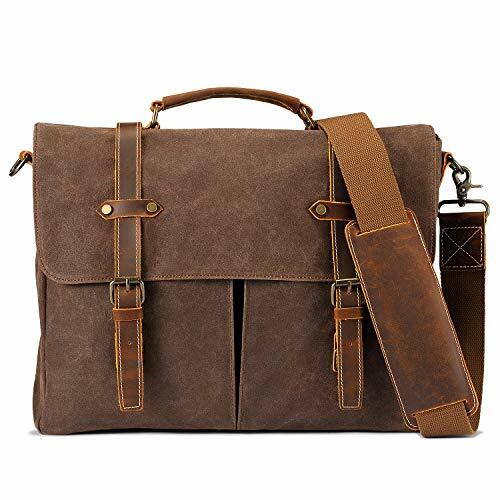 ❤ High quality and Water Resistant: Made of PU leather and water repellent waxed canvas fabric, strong buckles, smooth zipper, reinforced stitching, make this messenger bag build to last. You will get a classic crossbody bag, perfect for any situation, this stylish design keeps you moving in style and will receive many compliments during your commute, work, school, college, travel, etc. ❤ Shock-proof Briefcase: A thick foam padding laptop compartment with velcro closure protecting your laptop (up to 15.6 inch) from accidental bump, shock, scratch. ❤ Large Capacity : The office bag dimension is 16 x 4 x 11 inch. Total of 11 pockets. Main compartment features 4 inner pockets for your pens, phone, power bank, wallets, keys etc, The back pockets fits your valuables. The multi-purpose pockets design, roomy enough for all of your stuffs. ❤ Comfortable Carry: 20% off code :TPSEZ452. Long and wide shoulder straps of black shoulder bag can fully adjustable to keep you comfortable. ❤ Satisfaction Guarantee: All of our bags have 1-YEAR WARRANTY. 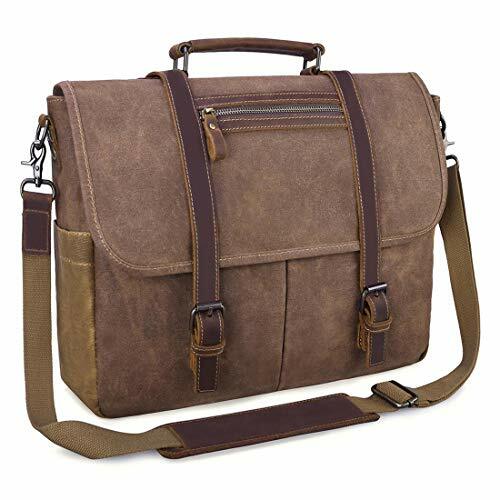 Just order this canvas leather satchel if you love it, there is no worry about the issue. We are serious sellers, and we are always responsible to our customers. If you have any quality problem with your bags, please contact us. We will resend or refund to you. SIZE : 38cm(L)x28cm(H)x12cm(W)/15"(L)x11"(H)x4.7"(W). Perfect size easy to carry 15" MacBook Pro / Air, 14-inch laptops , A4 file, iPad, kindle, cellphone, wallet, books and other small stuffs. Usage: commute, weekend, field, travel, school or everyday use. ORGANIZATION： 1 x main compartment, 1 x padded laptop divider, 2 x inner slip pocket, 1 x inner zip pocket, 2 x pen holder, 2 x front slip pocket . MULTIPURPOSE STRAP :With adjustable shoulder straps for comfortable wearing, no compression feeling at all. 2 Ways to hold as: shoulder bags, crossbody bags. Suitable for Commute, Business, Travel, Work, College or Everyday use. 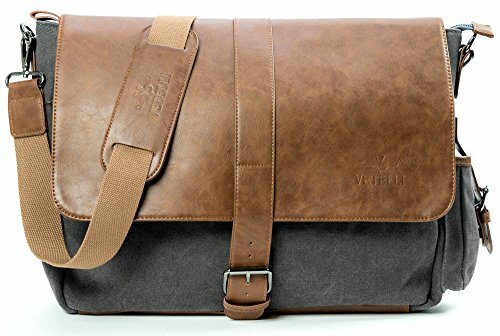 -CLASSIC:The Vaschy messenger bag is made of superior quality cowhide leather and durable waxed canvas which is gorgeous and last long. The aged cowhide leather comes with a rough appearance due to wrinkles and scratches. -VINTAGE: The delicate leather and anti-bronze hardware make the briefcase a vintage look.A contemporary take on the classic briefcase style. Adapted to suit the needs of the urban businessman, yet still retaining the traditional charm of it's predecessors.Combined with the leather handle and shoulder straps for enduring quality. Specifically chosen to resist wear and tear and provide reliable carrying capability. 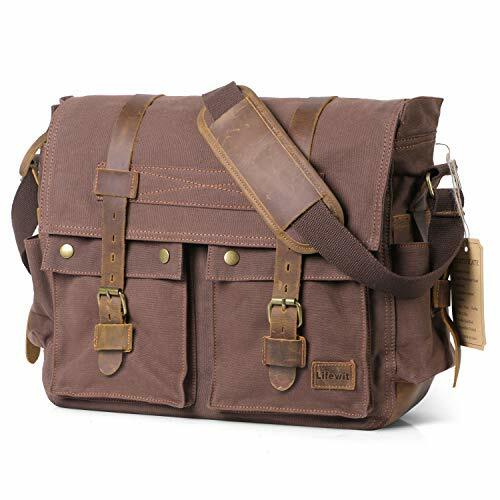 -SPACIOUS:The leather canvas messenger bag features a main compartment of the bag intended to keep up to 17 inch laptop or a notebook,the laptop messenger bag presents with a flap with two bronze buckle closure,a front pocket and a back zipped pocket. There is also a pocket inside additionally for your money, wallets, important notes.The strap is adjustable to provide comfort and can accommodate anyone. 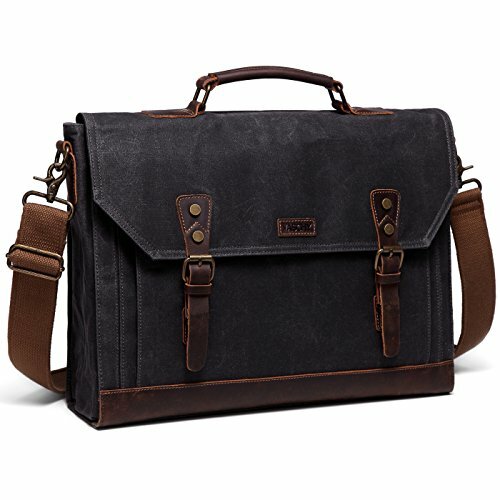 -WARRANTY:With one year Warranty, The Vaschy messenger bag is a heavy-duty shoulder bag suitable for those who like vintage or can be used as a professional business briefcase.It is perfect for college students, business professionals or travelers want to make a fashion statement. 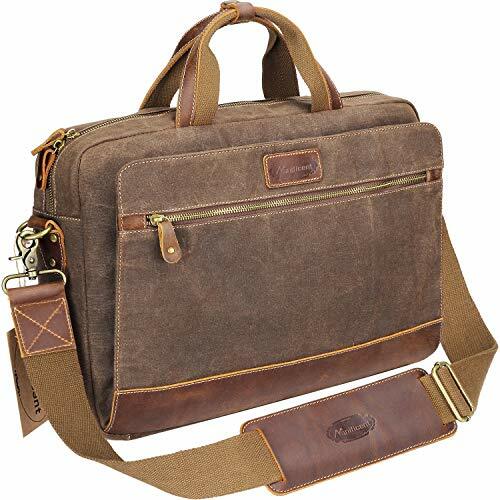 -SPACIOUS:The leather canvas messenger bag features a main compartment of the bag intended to keep up to 15.6 inch laptop or a notebook,the laptop messenger bag presents with a flap with two bronze buckle closure,a front pocket and a back zipped pocket. There is also a pocket inside additionally for your money, wallets, important notes.The strap is adjustable to provide comfort and can accommodate anyone. Premium Material Waterproof Construction - Made of superior cowhide crazy horse leather and heavyish water-resistant waxed canvas to ensure the use of long-term.The cowhide leather comes with a wrinkles and scratches appearance.Handmade series transforms the original natural beauty into every messenger bag. Plenty of Space & Padded Laptop Sleeve - The laptop bag is a decent large size that fits 15.6''MacBook Pro.Main compartment with zipper closure outside;The inside consist of a couple different dividers,a 15''laptop can easily fit inside and a built in divider between the inside compartments to help separate them all.1 zipper pocket inside for significant articles such as wallets and identification documents,2 inner slip pockets. Wide Strap & Magnetic Button- This satchel could also be a professional briefcase after detaching this strap.Adjustable and detachable strap makes it easy to handle and carry. 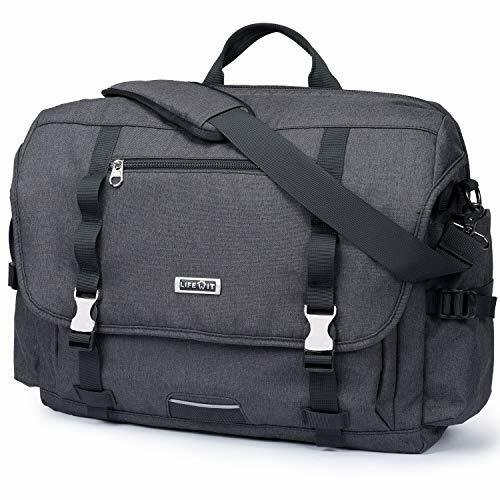 External Dimensions: 15.6"(L)x11"(H) x 4.33"(W),Laptop pocket: 15'' (L)x10.6(H)'',Shoulder Strap adjusts:31.4"- 55'',,Strap Width: 1.37'',Weight: 2.73 pounds. Incredibly Stylish - Sturdy enough to stand on its own,looks high end with formal or casual attire. Perfect for students, business or travelers want to make a fashion statement. 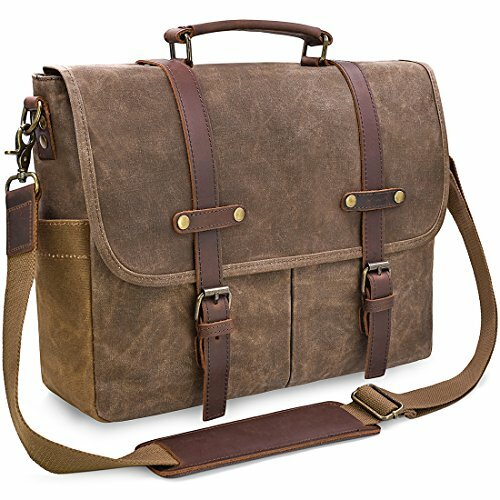 Vetelli Laptop/Computer / Messenger/Tablet Bag with Scratch Protection Lining for laptops or Macbooks up to 15.6". 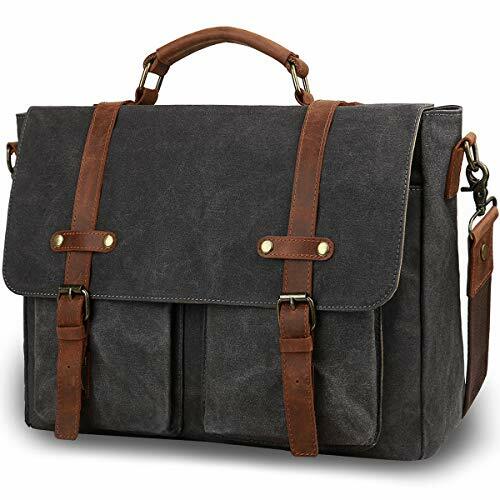 Leather + Charcoal Grey Canvas - Large Size Bag: 18" x 12" x 5"
STYLE & FUNCTION - The Vetelli Laptop bag features an elegant classic style that combines perfectly with modern functionality. Spacious interior compartments are fitted out with ultra-soft felt lining and a zip-free laptop sleeve to protect laptops, tablets, smartphones & other important accessories from scratches & damage. SPACE & PROTECTION - This messenger bag is nice and big. 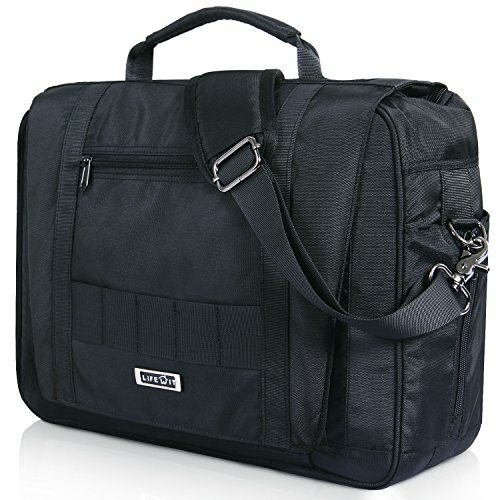 It's designed to easily carry a laptop (up to 15.6 inches) as well as all your daily essentials. The bag measures 19.5 inches long, 4.5 inches wide & 12.5 inches in height (49.5cm x 11.4cm x 31.75cm). Zippered interior & exterior pockets secure your items won't fall out. A magnetic snap closure on the exterior side pocket and an easy-open zip pocket on the back of the bag makes quick access to cellphones & accessories a breeze. PREMIUM GRADE MATERIALS - The Vetelli laptop bag combines high grade PU leather with robust charcoal grey waxed canvas for the exterior of the bag. The interior features ultra-soft felt lining with strong steel zips & a convenient velcro strap. The shoulder strap is adjustable & includes a shoulder pad for easy pain free carrying. Two swivel clips mean this shoulder bag is flexible to use on either shoulder without straps getting tangled. LIFETIME GUARANTEE - Vetelli laptop bags are backed up by a 100% customer satisfaction guarantee for life. EASY TO CARRY - The main padded compartment is designed to house 15.6-inch laptop computers of most brand, yet It also fits the more common 14-inch laptops like a glove. The leather is tailored from the different buffaloes so there would be a little different displaying in colors.Some part may be deeper in colors but other parts may be lighter in colors.All of them would not affect its beauty and function. 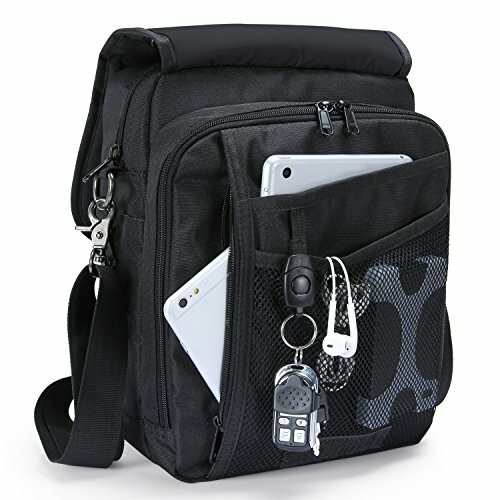 VARIOUS POCKETS - Besides the main storage compartment, the messenger bag is also featured on 2 larger Front pockets for easy access of frequently handled items, 1 zipper pocket for significant articles such as wallets and identification documents, and 2 Inner wall pockets to store cellphones, chargers, earbuds, and glasses. Dimensions: L10.6" x H7.9" x W3.5", weight:1.7LB, maximum recommended for iPad 9.7". This satchel purse is made of high quality PU leather, vintage metal hardware makes you be able to use this bag for many years to come. Trendy accordion style expandable organizer with center zip slot pocket for phone, wallet, iPad mini, lipstick, tissue, card holder, keys, etc. 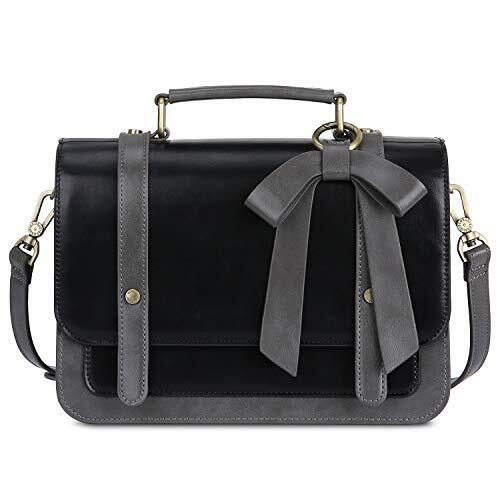 Removable bow decoration and adjustable and detachable shoulder strap easily convert it as school satchels, cross-body messenger bag, casual small briefcase. This cute shoulder bag is perfect for dating, party, daily outgoing, shopping, or traveling from day to night. Used as business briefcase, work bag, laptop bag, messenger bag. Perfect gift choice.